Cyclists in the City: Is the government planning to cut funding to bicycle infrastructure before it's even started funding anything in the first place? As German TV puts it: "there are no bike networks" here anyhow. Is the government planning to cut funding to bicycle infrastructure before it's even started funding anything in the first place? As German TV puts it: "there are no bike networks" here anyhow. Germany's main TV station came to London last week and devoted a whole section of its main daily news programme to cycling in London. What was the title of this TV feature? The ARD television people looked at how London's cyclists get to work and called it "transport chaos in London". Kind of says it all, really, doesn't it? Unsurprisingly, the news clip is in German. But I think it's worth watching, just to see the video selections that ARD chooses. And what I think is really interesting are the themes that the German TV crew pick out as being interesting about London. I've tried to summarise those points below because I think it's really informative to have a look at what London looks like from the outside. 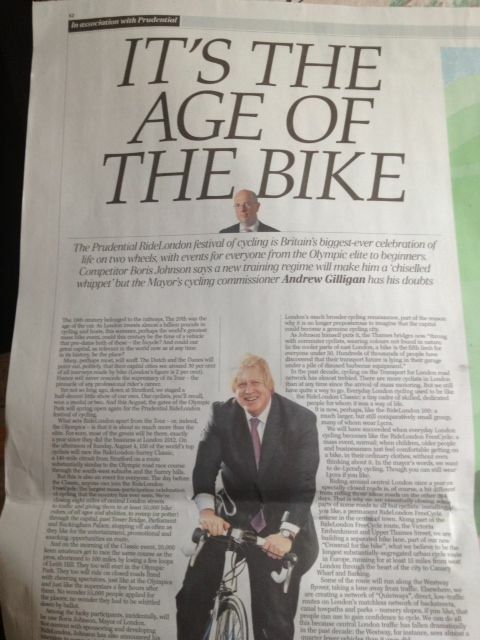 Bear in mind that Germany, although not nirvana for cycling, is literally decades ahead of the UK on this stuff. The German government is hosting its national cycling summit this week. Can you imagine the UK government hosting a cycling summit? I can't. In Berlin, the local government is aiming for 20% of all journeys to be by bike by 2025. London is aiming for 5%. The Berlin government, and many of Germany's large cities as well as rural areas are building massive bike networks - the sort of thing that the UK seems singularly unable to do. We're busy building more and more roads for driving. The Germans have decided that for journeys up to 15km, the bike is the way to go. And they're going all out to build networks to make people choose bike over car for these sorts of journeys. The UK is simply not keeping pace with Germany on this stuff. That is embarrassing enough in its own right. What's even more embarrassing is the weedy response that the UK government published this morning to a petition by The Times newspaper to encourage the government to really get behind cycling. There have been some rumours in industry press that the government might be preparing to launch an "Office of Active Travel" - a sort of mini version of the Department for Transport that would be tasked with building conditions that make it simple for people to chose cycling and walking instead of driving or taking the bus. Unfortunately, all we've seen from the UK government to date, however, is an unambitious and profoundly disappointing press release published this morning that repeats the message (for probably the tenth time now) that the government is spending lots of money on little projects here and there that might just about make a difference to a few roundabouts and a couple of junctions. No sign of a coherent national strategy and no sign of any standards that it expects local authorities to live up to. Local authorities big and small all around the country are beginning to want to do something about cycling. They look to the Department for Transport for ideas and standards to help them build good bicycle transport infrastructure. As one senior official put it to me today, "there's just a big hole" at the Department for Transport on cycling issues and standards. That seems true from my perspective. The government is all about cars, cars and cars. Oh, and a few scraps for cycling here and there. So, back to the German news story. What is the first thing it has to say about rush-hour? Well, the very first observation is that there's no bicycle network. Plain and simple, Germany's equivalent of the BBC observes quite correctly that London simply doesn't have what the Germans would call a bike network. And they're right. The reporter goes on to say "bicycles have to mix with with buses, cars and goods vehicles; if you want to travel through this [on a bike] you need courage, skill and, above all, luck". These are hardly conditions that would encourage most people to use a bike. 49 seconds into the clip is the terrifying scene of a cyclist on Cycle Super Highway 7 who is cycling straight ahead. The cycle highway is specifically designed to make cyclists go straight ahead in the (extremely fast) left turn lane for motor vehicles. What happens? A van overtakes, pulls straight across the guy on his bike and proceeds to very nearly kill him. This is institutionalised insanity. There is no way that a bike lane should be designed to deliberately mix flows of people using such hugely incompatible machines and make them use the exact same space to travel in two conflicting directions. That is a recipe for disaster, again and again and again. I think what really strikes me about this video are the shots of people whizzing along on bikes surrounded by lorries, buses and masses of motor vehicles. Somehow, listening to it all in German and hearing the incredulity of the reporter at just how ludicrous it all is, it makes you realise just exactly that: it is ludicrous that London isn't developing faster and better bike networks. The report does point to Boris Johnson's vision for real cycle-friendly networks but, as it points out, this is nothing more than a vision for the time being. "The Mayor’s “cycle vision”, published earlier this year, comes with a £913million price tag over 10 years, of which a £640million is subject to approval by the Treasury. A split over potential cycling cuts has emerged between the Mayor and Transport for London, which is prioritising renewal of existing assets, notably the Tube. The cycle vision is one of a range of transport programmes considered vulnerable as Chancellor George Osborne prepares to announce public spending cuts at the Comprehensive Spending Review on June 26." If the government really does want to cut funding for cycling, then we have a real problem on our hands. Funding for cycling hardly exists in this country. The Mayor has made small steps towards cycling in the past few years but his efforts hardly scratch the surface and he is only now beginning to take funding for bicycle infrastructure seriously. We'll have to watch this very closely and it may, and I stress, may, be time for people to come together again and start showing very clearly just how impatient they are to see things change on London's streets. There was talk of extending the Barclays hire scheme much further south to the outer London boroughs. So to summarise - outsiders point out the obvious poor state of London's roads; Boris's promise likely to be hot air. No surprises there then. When that £913 million was announced it was clear right away that approximately two-thirds of the promised funding was hypothetical - now we have the confirmation that it was probably wishful thinking. So what we have now is a situation where we'll probably only see approximately £300 million pounds of funding spread over 10 years i.e. £30 million per year. Given that TfL are currently underspending their budgets on cycling by approx £20 million per year that may only leave us with an additional £10 million pounds per year. Hardly a cycling revolution..
As per usual it's going to be more dead people (Daily Mail please note: people, NOT 'cyclists')that make a change. We're a world class city but we're failing to see what the rest of the world has already realised, the future of urban transport is walking and cycling. When even car obsessed NY is doing it, wtf are we still doing with 1960's thinking based around the car? My German's better than I thought, still. But one of the words that leaps out from that report: Krieg. War. Even the woman in normal clothes looks harried and uncomfortable. A German correspondent sent me a copy of this same video with the attached comment "England is a COMPLETE DISASTER as far as Cycling is concerned. This video confirms it all too clearly"
Was Boris indulging in wishful thinking with his vision, or was he trying to shame Cameron and Osborne into ponying up the cash? If the latter, he reckoned without "Ozzy"'s eccentric take on public expenditure - close a few hospitals, cut benefits,slah R&D budgets, whatever you like, but send out the roadbuilders in ever growing legions. He can approve funding for Bexhill-Hastings despite DfT advice not to, but it looks like he may can the east-west cycle link! As for that CS7 lane, we have been there before - on Blackfriars Bridge before 2005. Two people died there directly as a result. With the cycling strategy from Westminster Council we know that nothing is going to change in central London for a long time. It's time for more protests. It has to be more holistic than just cycling - I've had a had in a comment piece in a light rail magazine and it features a couple in Manchester - when the tram came to town they sold both 2 cars pocketing £15K, and set off saving £7.4K/year on VED/insurance and running costs, with the added outlays for 2 travelcards (£2K) and car 'hire' (from my experience over 37 years of not owning a car rarely more the £1k per year)and perhaps a further £1K/year on rail travel/taxis, and a couple of s/hand folding bikes - Nett annual saving over £3K/year. All this for no increase in their wages cost to the country, and no increase in their tax codes. Boris Bikes are crazily expensive, in part because they have the wrong tariff and operating system for rail commuter use, and have changed from the standard Bixi flexible system to a hard-wired and 'permanent' installations regime. German automated bike sharing schemes have no docking stations (so 50% reduction in non bike infrastructure)and have been running since 2001 - a commercial private operator has now got operations in 11 European countries, and set up a 50 bike hire scheme for a weekend in Birmingham for a cycling conference, compare that to a projected 8 months of road works and installation to bring Boris Bikes to SW London by December. Another system - which started quietly in London in 2009 before the Barclays scheme started - and is now going to be in at least 20 locations is that one hiring Brompton folding bikes not for a short grab & go bike sharing arrangement but for hiring for weeks or months at a time and taking everywhere with you. On top of that the Dutch OV-Fiets (bike hire for rail commuters which has grown from 1-2 locations to over 200 sites in 7 years in NL and now also runs in Belgium) is due to launch at over 50 stations in the UK with the 3 Abellio franchises. With this inertia the changes may well come insidiously and unstoppably not by planning but by the water-like overwhelming force of being what people want to do. Just watch how by sheer weight of numbers pedestrians and cyclists in cities with minimal formal traffic management control traffic priorities. Bring the speed limits down to 20mph where people are living & working on the street and this effect really starts to take hold. The inconvenient truth is we are NOT "busy building more and more roads for driving" and never have been. What we do in Britain is cram extra traffic lanes into existing general purpose roads, or build a second carriageway where space permits, but very seldom do we build an entirely new road. Sure we have built some new roads, but fewer and later than other countries, particularly compared to the pro-cycling countries of Northern Europe, and that makes it much more difficult to disentangle cycling from motor traffic. Just look at London: the biggest city in Europe by far and it didn't get a ring motorway until 1986. And then nothing more. Some parts of London are more than ten miles from any motorway, whereas no part of Berlin is more than 6 miles. But Berlin has special problems. Most German, Dutch, Danish and other cycle-friendly cities have much more comprehensive networks of motorways and other new roads, onto which motor traffic can de diverted from the old arterial roads, to make space for good, wide, separate cycle tracks. No part of Amsterdam is more than 2½ miles from a motorway. Likewise the Ruhr. Just go to Google maps and compare British cities with similar sized ones in Germany, Netherlands, etc. Compare our messy tangles of widened old roads with their brand-new ring-roads and motorways everywhere. To give Britain a network of roads "just for driving" comparable to that which our cycle-friendly neighbours already posess would require a programme of new road construction the like of which we have never seen and that almost nobody in this country wants, least of all us. That is the elephant in the room of cycle campaigning. Our more provident neighbours have somewhere else to send the traffic. All we can do is wish it away. Sorry, but I have to darken your overly positive image of cycling in Germany a little bit. Basically there are two kinds of cycling facilities: the ones built for cars and the ones built for cyclists. 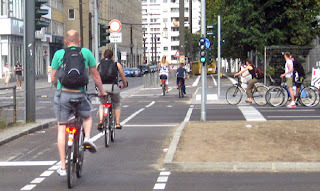 In Germany, 90% of cycling facilites are built for car drivers. The choice between parking spaces and 50 kph against safe cycling facilities is almost in every case decided in favour of motorized traffic. So cyclists end up on facilities more dangerous than cycling on the carriageway mixed with motor-traffic. One example: Hanauer Landstraße in Frankfurt a.M.
That's pretty awful. It clearly does not meet the German criteria for compulsory use, i.e. state-of-the-art surface, clear priority at side roads, unobstructed 2m width... I guess the local branch of ADFC will be demanding improvements or replacement of the blue compulsory signs with monochrome Bikes Frei (permitted) signs? I think it's acknowledged that Germany isn't cycling heaven yet, but it's a good way closer than we are and does have a national standard for cyclepath quality. And since they can't ban bikes from the road without meeting the standard, there's a mechanism that motivates local authorites to meet the standard. Such mechanisms don't always work of course, but ADFC have succeded in removing blue signs from sub-standard paths. And when cyclists are prosecuted for using the road, my ADFC contact tells me that it's usually possible to find some defect with the path that gets them off. The final point the speaker makes is important (after pointing out that Ben Porter arrived alive). He says that for the 13km trip that Porter took, there is only one form of transport that can do it as fast - the bike. They're not going away. I was watching some of the footage about the late Lady Thatcher recently. One quote attributed to her is, "In my lifetime all our problems have come from mainland Europe and all the solutions have come from the English-speaking nations across the world." She was plainly not talking about traffic and transport!